VANCOUVER, BC, February 21, 2014. Mirasol Resources Ltd. (TSX-V: MRZ, Frankfurt: M8R) announces that it has identified numerous exploration targets for trenching and drilling at its 100%-owned Virginia silver project, Argentina. These exploration targets are in addition to the Julia, Naty, Martina and Ely veins where previous, extensive drilling of seven separate vein segments has defined silver mineralization (reported in Mirasol news releases from 2010 to 2012). Mirasol’s work at Virginia property exploration program identified a number of new, high-priority drill targets, many with good grade silver at surface. 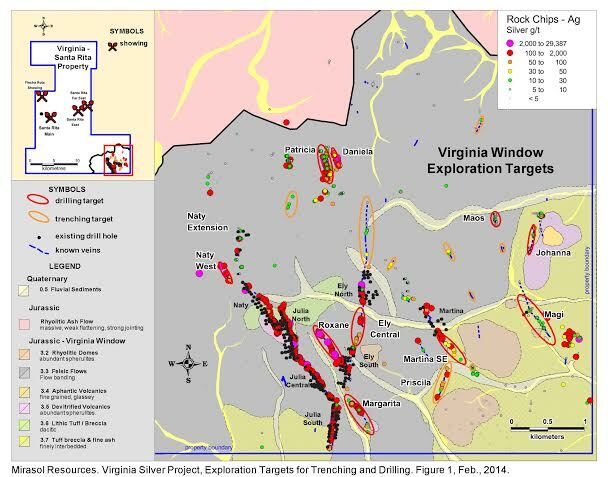 These targets enhance the upside-potential and attractiveness of the Virginia project’s significant silver vein mineralization identified through drilling from 2010 to 2012. At Virginia, Mirasol has drilled more than 23,000 m in 195 diamond drill holes. However, only 9 of these holes are located outside of the seven principle vein segments which contain the bulk of the silver mineralization delineated by detailed drilling; many good targets remain untested by drilling. Since the discovery of the Julia Vein in late 2009, Mirasol has completed extensive surface exploration in the Virginia Window (Figure 1), including rock chip sampling, geological mapping, ground magnetic and induced polarization (IP) surveys, and trenching. Exploration data from all work completed to-date has been used to build a comprehensive geological model of the Virginia silver veins. This model was used to rank 65 possible exploration targets, including 11 targets for trenching; and 10 targets for drilling. The model reveals that most areas which have been drilled are partially eroded silver-bearing quartz-vein shoots which had high silver grades at surface. The model suggests it is likely that additional, untested, shoots are covered by soil, and that other shoots may lie at deeper levels within fault structures that are exposed at surface, but which lack high-silver grades at the current level of erosion. Blind silver shoots were discovered by drilling under thin soil cover at the nearby Ely North and Ely South veins; it is highly likely that other blind shoots exist. High silver grades exist in samples of float and sub-crop at a number of targets in the northern and western part of the Virginia Window (e.g., the Naty West, Patricia, Daniela and Roxane) which are drill-ready targets. In east part of the Virginia Window a number of targets exist which have anomalous silver and indicator trace-elements, located along prominent fault structures which may represent shallow levels of silver-bearing epithermal systems, such as Magi, Maos, and Johanna. Only two holes have been drilled on these eastern targets to date, and both holes encountered better and thicker intervals of silver mineralization than was encountered at surface. Magi and the other targets in this area warrant drill testing. Previously reported drilling on the Virginia silver project has identified important high-grade silver mineralization over significant widths. Selected intervals are shown in Table 1. * Results for all of these holes have been previously published. This select summary represents the three best drill hole intercepts at each of the seven areas as defined by the highest silver grades x true thickness product. As such, this list in not representative of all the holes drilled. A total of 11 targets are recommended for trenching in a Stage 1 exploration program. A Stage 2 program is recommended to drill 10 additional targets and all of the targets from Stage 1 trenching that respond positively, and also test at greater depth some of the seven drilled vein segments with extensive drilling. A C$3.2 million budget is proposed, comprising two components: Stage 1 to include 1,200 m of trenching which is budgeted at approximately C$200,000, and Stage 2 with 8,000 m of diamond drilling at approximately C$3.0 million cost, for a program total of C$3.2 million. The Virginia project contains high grade silver mineralization at-surface occurring principally as the mineral acanthite, in shoots amenable to open-cut development similar to AngloGold Ashanti’s Cerro Vanguardia gold-silver mine in Santa Cruz Province. Initial metallurgical studies performed to date confirm that the high-grade Virginia vein material responds well to conventional processing with up to 80% silver recovery. Mirasol intends to seek a strategic joint venture or development partner to advance the Virginia project. A 43-101 Technical Report for the Virginia silver project has been filed on SEDAR (www.sedar.com) and posted to the Company’s website (www.mirasolresources.com), which documents in detail the recommended work program, and has been prepared following National Instrument 43-101 guidelines by non-independent Qualified Person Dr. Paul Lhotka on behalf of Mirasol. Paul G. Lhotka, Principal Geologist for Mirasol, is the Qualified Person under NI 43-101 who has approved the technical content of this news release for Mirasol. Exploration at Mirasol’s Projects is supervised by Stephen C. Nano, Vice President of Exploration; Timothy Heenan, Exploration Manager; and Paul Lhotka, Principal Geologist who is the Qualified Person under NI 43-101. All technical information for the Company’s projects is obtained and reported under a formal quality assurance and quality control (QA/QC) program. Drill core, rock chip and stream sediment samples are collected under the supervision of Company geologists in accordance with standard industry practice. Samples are dispatched via commercial transport to an ISO 9001:2000-accredited laboratory in Mendoza, Argentina for analysis. Results are routinely examined by an independent geochemist to ensure laboratory performance meets required standards. Assay results from diamond drill core or RC drill samples may be higher, lower or similar to results obtained from surface samples.